No-Bake Oreo Cake is one of the easiest and fastest desserts ever: it can be prepared in many versions but surely the most famous and loved is the cheesecake. The versatility of these cookies means that preparing an Oreo cake is really simple and, above all, that the result is always guaranteed. 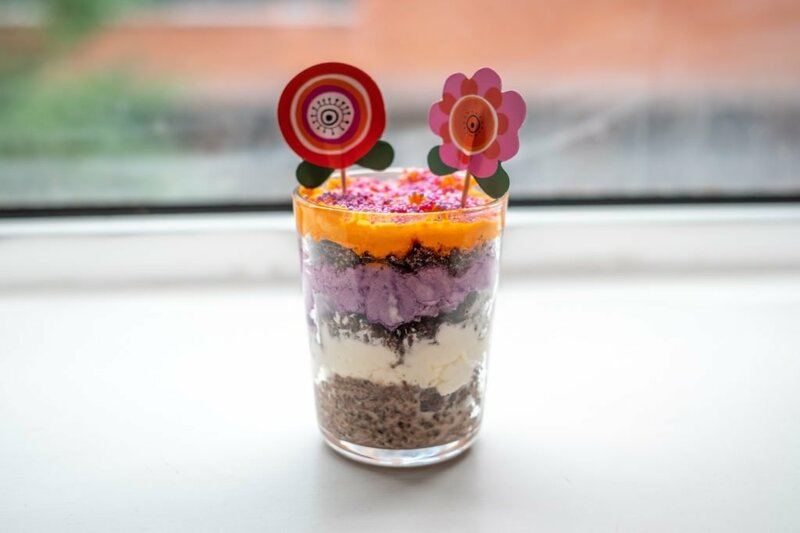 In this case, for example, instead of preparing the Oreo cake in the classic version and the classic size (20-22 cm), I decided to make it in a glass, so as to make it more pleasant to serve and even less demanding. The basis of every self-respecting Oreo cake is, of course, the homonymous cookies; there are those who crumble the whole biscuits and those who divide them in half by removing the internal cream and just crushing the biscuit. In this recipe, we whisk them coarsely without dividing them so that the cream, melting, acts as a glue and you do not need butter to keep the biscuits together. The classic filling for cheesecake is prepared using fresh spreadable cheese or cream mixed with mascarpone; to prepare this No-Bake Oreo Cake, we use a layer of unsweetened whipped cream and two layers of fruit smoothie, one made with blueberries and one made with peaches. You can use fruit of any type, as long as it is colored and quite soft so that you can make the cream (pears and apples are not good, melons, watermelons, apricots and similar are perfect). No refined sugar is added, and the cake is not too sweet since the biscuits are not sweet at all. 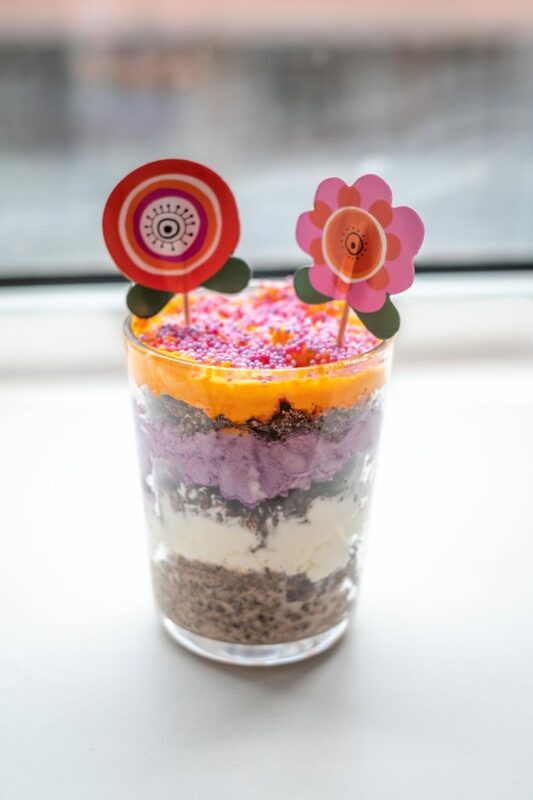 The result is a multicolored cake, easy to prepare, quick and can be prepared both in glasses and in a classic cake tin; after the recipe, you will find some tips to prepare a No Bake Cake of this type. Take the glasses out of the refrigerator and add a layer of crumbled Oreo. Finish with a last layer of Oreo. Put in the refrigerator for about 30 minutes so that all the ingredients are set and serve. To prepare a more classic cheesecake with Oreos, you can follow the directions you find here. Remember that for your cheesecake to be firm and tasty, you should allow at least 7 hours to pass before consuming it. To give your Oreo cake even more flavor, take a second pack of biscuits, remove the cream inside each biscuit and add it to the first layer of whipped cream. In this way, your cheesecake will taste even more “Oreo”. You can keep your Oreo cake in the glass in the fridge but, if you want, even in the freezer for a nice cream effect. Just take it out a few minutes before serving it and it will be perfect. For the sugar-free version of this Oreo cake, you can simulate the Oreo base by blending dates, nuts and bitter cocoa. In this way, you will obtain a base similar to that with Oreo but without refined sugar.